Shoreview resident Barbara K. Mednick has been a decorative folk art painter for more than 25 years using acrylics on wood, clay, paper, glass and fabrics. Her original hand painted designs are inspired by nature; with flowers, fruits, pine cones and ladybugs among her favorite subjects. You can find the hand-painted cards, bookmarks and flower pots she creates at local art galleries and flower shops. She also enjoys giving them as gifts to her family and friends. Barb has a love of art and constantly strives to improve her painting and stroke techniques. Decorative folk art painting, which has its roots in Europe, combines both traditional strokework folk art and the new techniques of bold painting and blending. In America, the European folk art traditions were adapted and practiced by the European settlers, particularly in Pennsylvania, where the German painting tradition that followed became known as Pennsylvania Dutch (or more correctly, Deutsch). As a leisure painting pursuit, decorative folk art painting is now an established genre worldwide. Each piece is carefully painted by hand and makes a unique gift for family, friends, teachers or co-workers and colleagues! Each design is skillfully created with a brush and Barbara’s imagination — not a stencil or stamp. 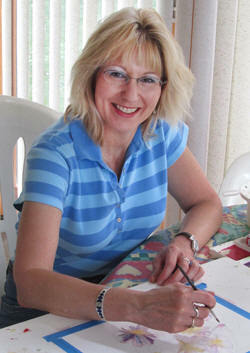 Barbara has had formal training in decorative painting techniques and constantly strives to improve her skill level and incorporate new techniques. Designs can be customized to your needs or you can choose from one of the many current designs featured on the website to be applied on wood, paper, clay or glass. You can specify color schemes and/or consult with Barbara about the desired look or color scheme you would like painted. Designs can be painted on wood plaques and boxes, flower pots, bookmarks, note cards, glass and fabric. Special hand-painted gift bags for a special fundraising event for a local organization. A customized pink and white rose bud design on a wood birdcage for use at a wedding. A customized note card design to complement a businessperson’s corporate identity. A special laminated bookmark that matches the pine cone theme at “Cove Point Lodge”, a rustic lodge on Minnesota’s north shore. Brushworks "Expressions" note cards - emotive sayings and artwork combined together to create a truly special expression. Click here!